As frequent readers of Foothill Agrarian will know, I am deeply appreciative of the fact that my work takes me outdoors nearly everyday. On particularly hot days, sometimes I question my choice of professions (or at least my choice of locale), but even on days like this one, I find that being outside is what I enjoy most. If I'm paying attention when I'm working outside, there is always something new to observe. The wet spring and the unusual late June rainstorm this year have had a number of interesting impacts on the natural world. Late rain seems to favor yellow starthistle (California's new state flower, I think). As a late maturing annual plant with a deep taproot, starthistle can take advantage of late-season moisture. 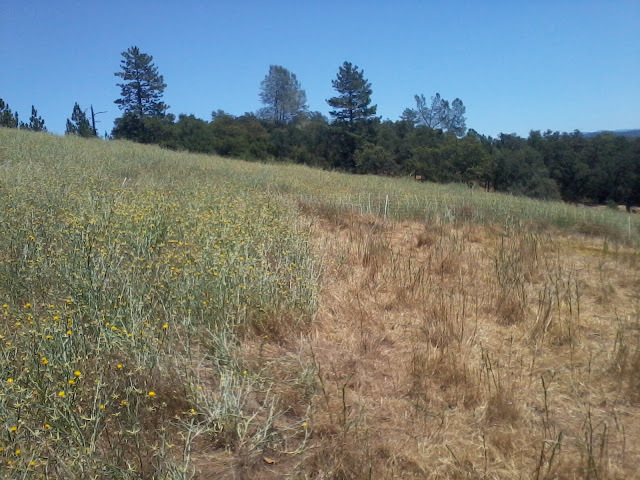 This year's crop of starthistle is especially impressive. While it's a terribly invasive and annoying weed, it does provide reasonably good nutrition for livestock when the rest of our forage is dry and of low value. 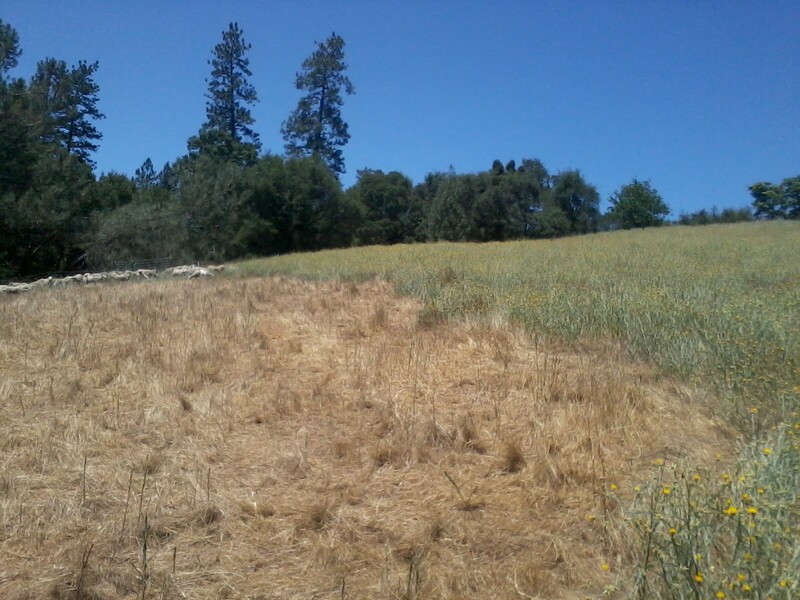 We currently have sheep on the Placer Land Trust's Canyonview Preserve here in Auburn. The sheep are absolutely annihilating the starthistle - here are a couple of fenceline photos for proof! Please excuse the quality of these photos - I took them with my phone, which is only of average intelligence! I've also noticed that many of our native oaks (in our region, these are mostly blue oaks and interior live oaks) have put on a burst of new growth since we received nearly an inch of rain in late June. In dry years, I've observed the strategies that these trees use to survive the lack of moisture (like losing their leaves earlier than normal), but this is the first time that I've observed them taking advantage of the gift of late rain. Agriculture, if it is to be successful over the long term, should work in partnership with nature. I wonder if our farming and ranching systems are flexible enough to take advantage of favorable conditions (or to adjust to unfavorable conditions). Add this question to the ever-growing list of reasons why I love my job!